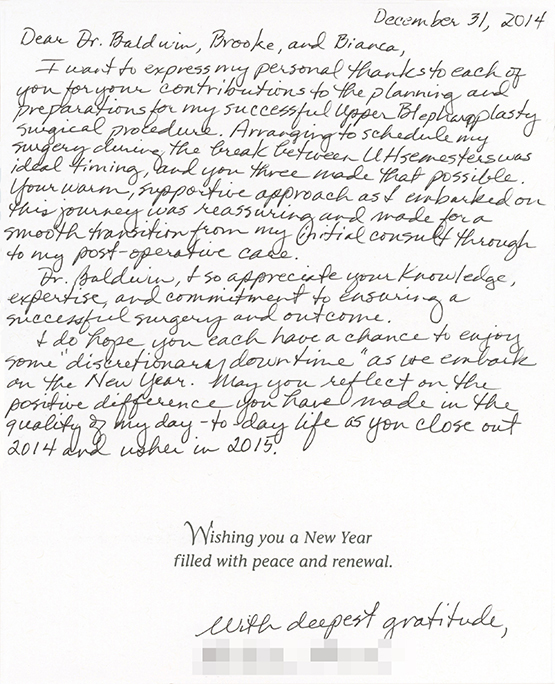 I want to express my personal thanks to each of you for your contributions to the planning and preparations for my successful upper blepharoplasty surgical procedure. Arranging to schedule my surgery during the break between UH semester was ideal timing, and you three made that possible. 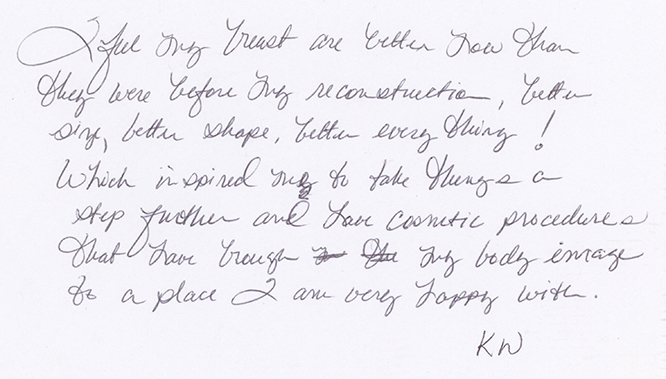 Your warm, supportive approach as I embarked on this journey was reassuring and made for a smooth transition from my initial consult through to my post-operative care. 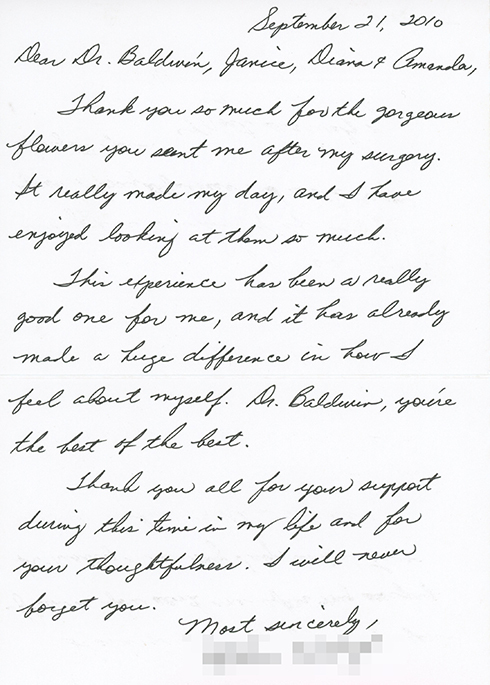 Dr. Baldwin, I so appreciate your knowledge, expertise, and commitment to ensuring a successful surgery and outcome. I do hope you each have a chance to enjoy some “discretionary downtime” as we embark on the New Year. May you reflect on the positive difference you have made in the quality of my day-to-day life as you close out 2014 and usher in 2015. Wishing you a New Year filled with peace and renewal. 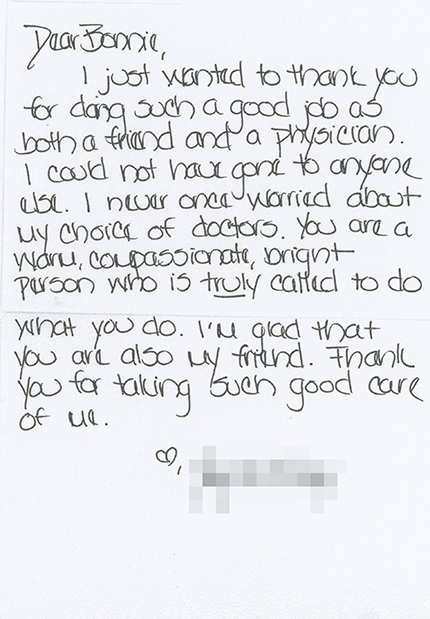 I just wanted to thank you for doing such a good job as both a friend and a physician. I could not have gone to anyone else. I never once worried about my choice of doctors. You are a warm, compassionate, bright person who is truly called to do what you do. I’m glad that you are also my friend. Thank you for taking such good care of me. Thank you so much for the flowers. 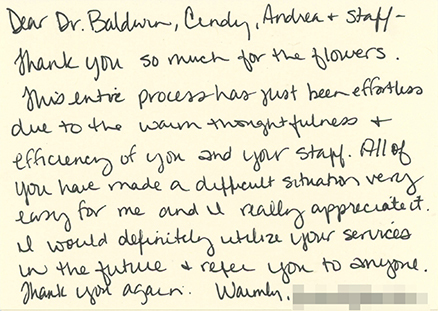 This entire process has just been effortless due to the warm thoughtfulness & efficiency of you and your staff. All of you have made a difficult situation very easy for me and I really appreciate it. I would definitely utilize your services in the future & refer you to anyone. Thank you again. Thank you so much for the gorgeous flowers you sent me after my surgery. It really made my day, and I have enjoyed looking at them so much. This experience has been a really good one for me, and it has already made a huge difference in how I feel about myself. Dr. Baldwin, you’re the best of the best. Thank you all for your support during this time in my life and for your thoughtfulness. I will never forget you. I feel my breasts are better now than they were before my reconstruction, better size, better shape, better every thing! Which inspired me to take things a step further and love cosmetic procedures that have brought my body image to a place I am very happy with.